Completed in 2009, the David Allan Hubbard Library, named for the seminary’s third president, has been a rich educational resource for the Fuller community and beyond. More than only holding growing collections, the library has been used for lectures, an art gallery, computer lab, tutoring services, archives, and more. "My name is Asher Hammer, and Miyoung Yoon Hammer’s my mom. Fuller is just a hop, skip and a jump from my house, and I walked down to campus every summer. After stopping by the Pasadena Public Library, I’d often buy juice and a croissant from Coffee By the Books and walk to my Mom’s office. One day, Mom told me to work in the library, so I set off to explore this Atheneum, this place of study and studiousness, this nook of knowledge. I had hardly walked past security when I heard the joyous sounds of “Doot, doot doot, dut dut dut duh doo”—the Mario World theme song! I looked to my right ad saw a TV for students to take a break from studying. I was feeling self-conscious with my backpack and flip-flops, but just then I recognized one of the students as a friend of my family. Victory! Joy! I could now play without feeling too self-conscious (I love this about Fuller. There’s a real nice community that’s really fun to be a part of. I feel like I know people). I introduced myself to everyone, and soon enough, I got my chance to play. Me being the twelve-year-old boy I was, I got a total of no homework done that day! When I went back next year, Mario World was gone. Pity. I would have loved to play, and share that experience with others. I hope whichever institution uses the campus next might do something like this. Maybe I’ll walk over the 210, past the library, under the shadow of City Hall, past the bookstore, past the green-and-white-striped building that held my mom’s office, past the Refectory, into David Hubbard’s library, and ask to play." "During library construction, at one point the DAHL elevators worked, but the call buttons weren’t in operation. So, we had elevator operators with walkie talkies to move the carriage from one floor to another. I was lucky enough to sit on a folding chair in the elevator, walkie in hand, waiting for the next employee to load furniture/ books/ people into the lift. It was actually a lot of fun." 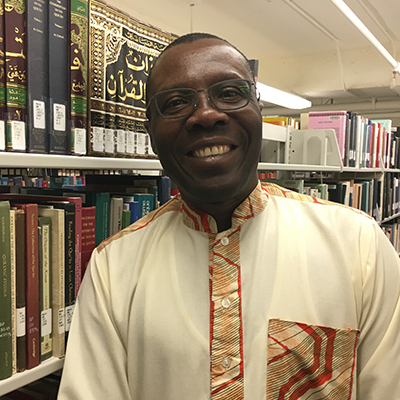 "I was admitted into the PhD Intercultural Studies program in 2015 and started with the summer 2015 cohort. Barely a month into the program, I became despondent, sick, and began contemplating withdrawing. On Thursday, September 3, 2015, having been woken up very early that morning by a telephone call from one of my relations in Nigeria, I set out early to begin working on my ‘Updated Proposed Research Interest Statement (PRIS)’. As I struggled to grasp what exactly I should write about, I had a sense of frustration. Then I spent a short time praying in my room at 454 Ford Place. I headed out to David Allan Hubbard Library to continue work on my academic assignments. As I reflected on the amount of work before me, I posed several questions to myself: ‘Is this really what I want to do? Must I get a PhD? Why should I embark on what I do not seem to have an inner motivation for?’ I felt grossly inadequate for this doctoral work. Questions clouded my mind. Can I really make it? Should I continue or withdraw? Now, today, February 22, 2019, as I write this reflection I am amazed at God’s faithfulness. By his grace, I am hopefully one and half years shy from graduating from my program at Fuller. I don’t know what organization that will take over this building when Fuller moves to Pomona. But I know this one thing about this building: I heard God’s voice at David Allan Hubbard Library! That word has kept me going… May he continue to speak in this place, even when Fuller transfers ownership to whoever will purchase it! Amen and Amen!" “I took a long road trip from Memphis to Pasadena in late spring 2010 to start the MAT program at Fuller. 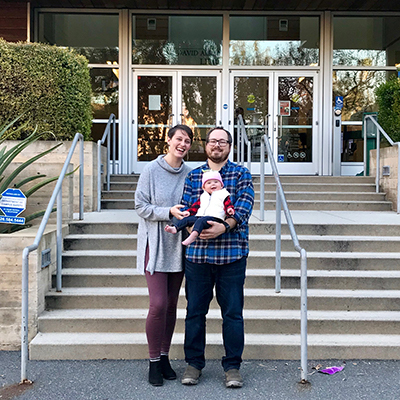 Nine years later, the Pasadena campus holds countless memories—but perhaps the most significant ones occurred in the environs of the David Allen Hubbard Library. It was on the steps just outside the library that I first laid eyes on one David Hunsicker. Sporting a baseball cap and a crossbody Patagonia bag, he was entering the library to finish a paper for his PhD seminar that quarter. Fast forward a few months: After class, I found myself locked out of my Fuller apartment, so I plopped down on the wooden bench outside the library. A couple minutes later, lo and behold, there was David Hunsicker again, walking down the library steps and suggesting we go grab dinner. Having nowhere else to go, I (happily) obliged. As silly as it may sound, I still get butterflies in my stomach when I recall him exiting the library and giving me a sweet smile as he invited me to eat with him. David’s preferred study spot in the library was the first floor reading room, so as we began to spend more time together, I would often find him there. I have a distinct memory of him reading Stanley Hauerwas’ theological memoir, Hannah’s Child, in that room and using a silver chewing gum wrapper as a makeshift bookmark. As you share your memory, be as specific as possible: What building were you in? Who were you with? What geographic details still stick with you today? The more concrete and descriptive the memory you share, the more the Fuller community can enjoy this moment with you.